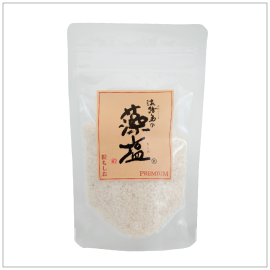 The development of moshio, seaweed salt, has a quite of a history where it initially started during the ancient times when the Japanese were burning seaweed and using the resulting ashes as their salt. As time progressed, the salt making technique advanced to drying gathered seaweed under the sun until salt crystals formed which were rinsed off into a pool of salt water to create a concentrated brine that was then boiled down to form a crystallized salt. Handcrafted by professional salt craftsmen diligently boiling seaweed salt water for three consecutive days. Once the water completely evaporates, the batch is then put through sieves to collect only the large crystals of salt. 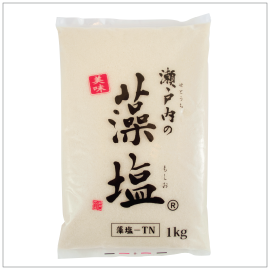 This ultra-premium moshio is the perfect salt for delicate high-quality ingredients. Reasonably priced moshio as it is manufactured through the moshio production line. Slightly drier type of moshio, it has mellow but rich mineral taste that enhances flavors of any type of dish.